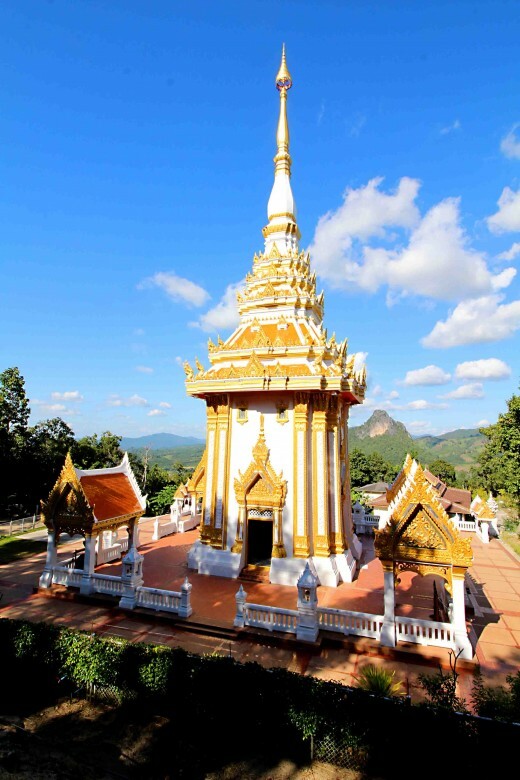 The Province of Loei in the northeast of Thailand, is little known to most Western visitors to the country, the majority of whom are more interested in the beaches of the southern Thai islands, the bright lights of Bangkok or the hill culture of the northwest. Only backpackers travelling cross country to the neighbouring nation of Laos will commonly pass this way..
And yet the whole of the northeast, and Loei in particular, have much to offer to visitors, from unique culture to scenic countryside. 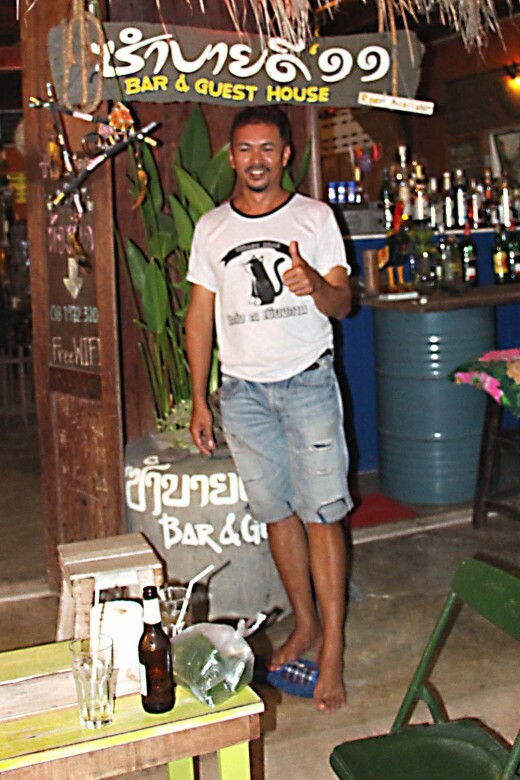 And even if Western tourists haven't yet discovered it, domestic tourists certainly have - Thai nationals come in their droves to this part of Thailand, and one town in particular attracts them on weekend trips from the far distant capital, or on day trips from the surrounding provinces. That town is Chiang Khan, and what most attracts the Thais are well preserved teakwood houses, a legacy of late 19th century Laotian refugees who had arrived in the region during a period of turmoil in Laos, just a few hundred metres away on the other side of the great River Mekong which forms the border at this point. The refugees had crossed the river and settled on the Thai side, building a long street on the river bank lined with the typical teak houses of the era. Thus the town of Chiang Khan was born. Subsequently the town was expanded further south, but that original main street on the river bank became neglected. 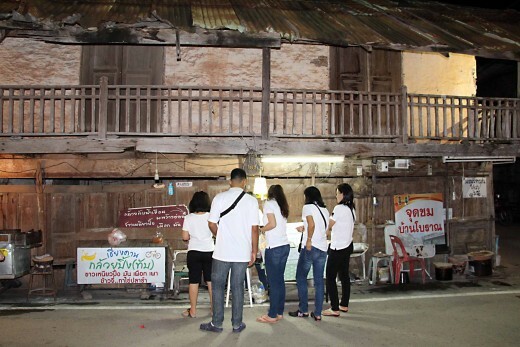 It was never developed, and the consequence was that the old wooden buildings remained in place to the present day - a street where time had stood still and where modern Thais of the 21st century could experience just a brief flavour of their cultural heritage. That is why they come today to Chiang Khan. 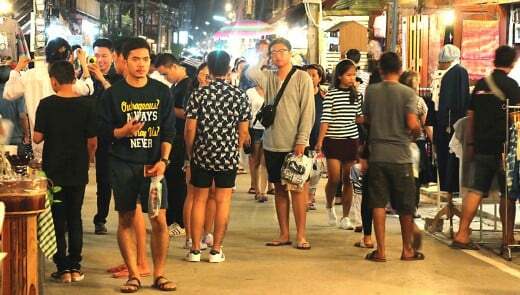 But many of the Thais who visit this street in Chiang Khan - known as the Walking Street - have come hundreds of kilometres, and they can't all afford to fly. By bus or train it may well take many hours, and a trip to the town therefore becomes at the very least, a weekend break. And that means that there has to be more to fill up their days than just one street. And indeed there is.Thais of course may know what else lies in the vicinity of Chiang Khan, but what of those Western backpackers and other foreign tourists drawn to the town? This article is a personal experience of some of the other attractions of Chiang Khan, intended for the benefit of any who come this way. All photos on this page were taken by the author on two visits to Chiang Khan in 2016 - a day trip in January, and a weekend break in November. 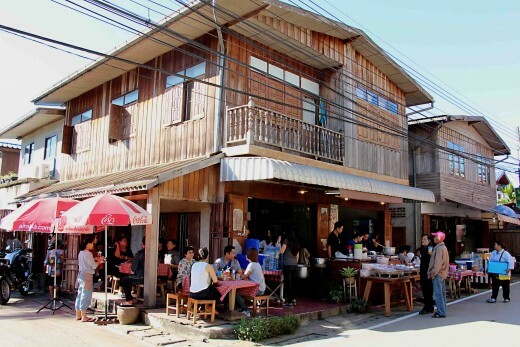 First and foremost people come to this region to walk on the narrow road where the traditional teak houses still stand, but which has now become a hive of activity every evening as street entertainers, souvenir stalls, arts and crafts shops, cafes and bars take over. 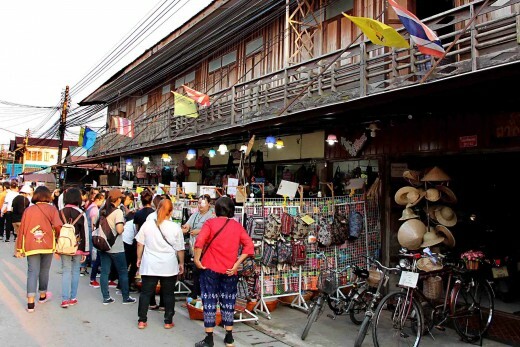 The importance of the Chiang Khan Walking Street as the focal point of the local tourist trade is such that I have devoted a separate page to it. 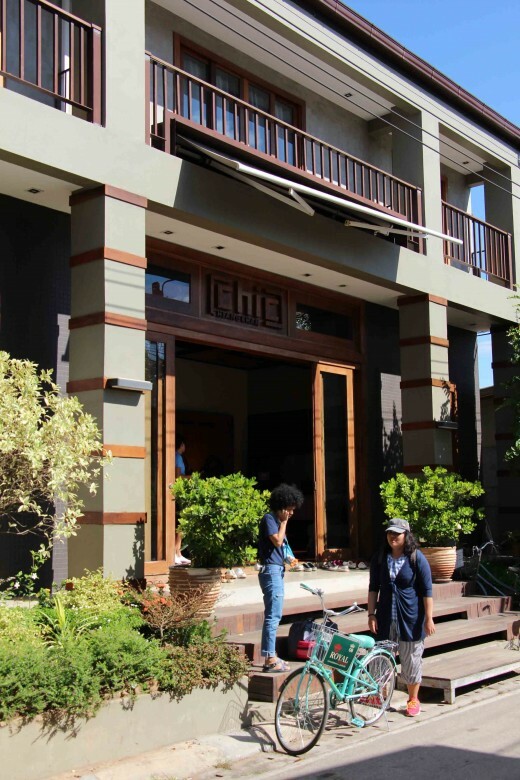 This companion article looks at everything else which can be seen or done in this region a few hundred metres, or a few kilometres away, from the street. I came to this part of Thailand twice in 2016 - once on a day trip by car with friends from the nearby province of Udon Thani, and once by overnight bus from Bangkok to spend about two days and two nights in the town with my girlfriend. On this second visit, most of our first day was spent in the town itself, on the Walking Street. But on the second day and on the final morning we explored a little of the local countryside near to the town. In this article some of the sights seen will be recorded, together with some further information about visiting, which hopefully may be of value to some who visit this isolated little Thai town and province of the northeast. Visitors to the town tend to rise before dawn - and they rise with a purpose. They head off in one of two directions. 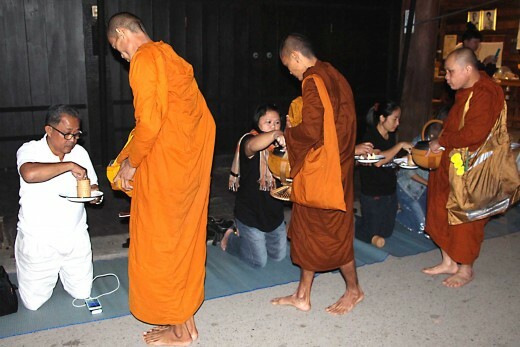 Some go to one end of the Walking Street to see the ceremony of giving alms to local Buddhist monks who pass this way each day before sunrise - an event described in my companion article. If you only have time in Chiang Khan to witness one daybreak, then make this little local ritual your priority. But if you are in the town for a second morning, then head off to the hills. There is one spot in particular where many hundreds will congregate before dawn to wait for, and then watch, the rising of the sun over Chiang Khan and the River Mekong. 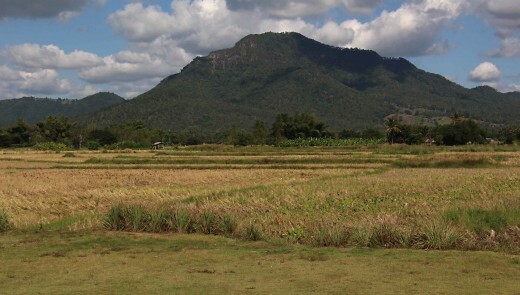 The hill they choose is called Phu Thok and it stands 250 m above the surrounding countryside, 3 km southeast of the town. 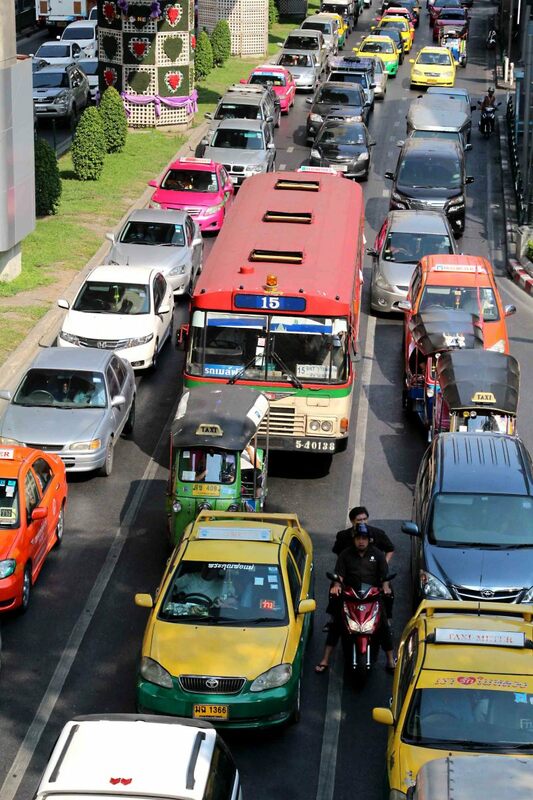 It can be reached by local three-wheeler tuk-tuk taxis, followed by one of the songtaews - a fleet of covered pickup trucks which ferry people to the top. Many visitors will spend a couple of hours or more on Phu Thok, watching the day break - it seems almost a spiritual experience for some. And then they take the ride back to Chiang Khan - but not before pausing to browse the souvenir stalls or grab a snack at the food stalls which line the path to the songtaew ranks. A visit to Phu Thok Hill may whet the appetite to see more of the local countryside around Chiang Khan. And one doesn't have to go far to do so. The region here is sparsely populated and rural - major cities are few and far between, and villages with a distinctly local lifestyle are the norm. Within a few kilometres of the town are rolling hills and low forested mountains and fields of crops. 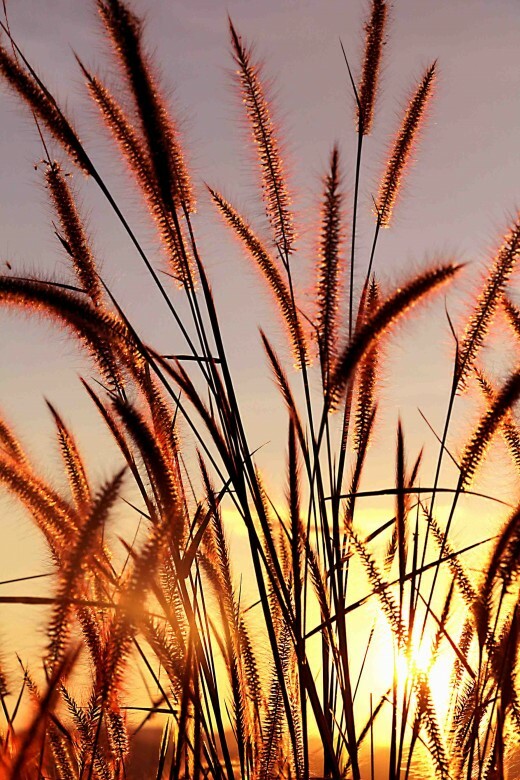 This is a fertile region, and agriculture is a very important component of the local economy - rice, maize, soybean, coffee and a range of tropical fruits are grown here. Non-food crops including cotton and rubber are also extensively cultivated. Liker Phu Thok, the summits of some of the hills and mountains can easily be reached by car or on foot if you are fit enough (bearing in mind the intense summer heat) for great views of Loei Province. 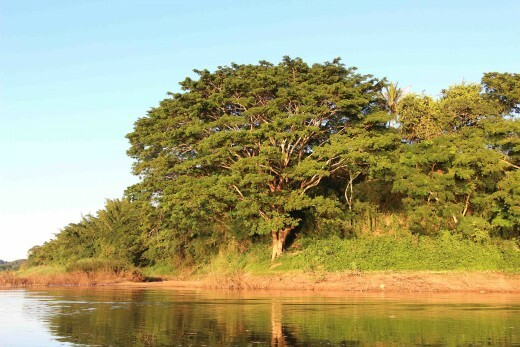 Lakes and rivers as well as waterfalls are also a feature of the region, and the unspoilt nature of much of the countryside has resulted in several areas in the province being designated as national parks. Those in Phu Kradueng, Phu Luang and Phu Ruea are noteworthy, though not particularly close to Chiang Khan. 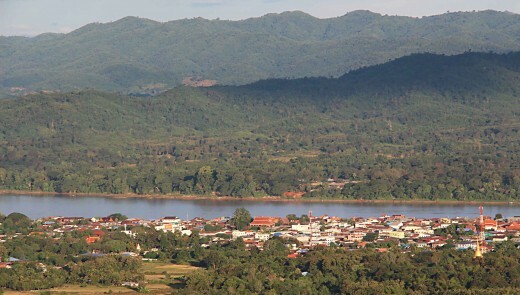 In the vicinity of Chiang Khan, there are many vantage points to oversee the Province of Loei but there is nowhere better to view the nation of Laos than the location depicted below. 21 km west of Chiang Khan, the mighty Mekong parts company with Thailand as it turns north into Laos. 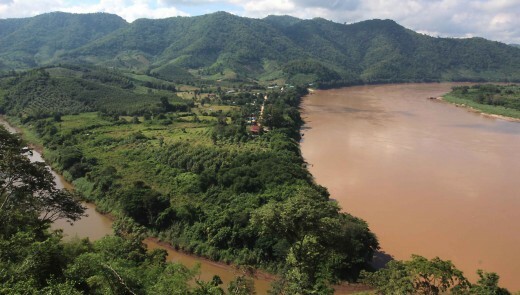 Instead the Thai-Laos border beyond this point is formed by the Hueang River - a small tributary of the Mekong seen in the extreme bottom left of the photo. At the same location is a man-made sight also worth seeing. 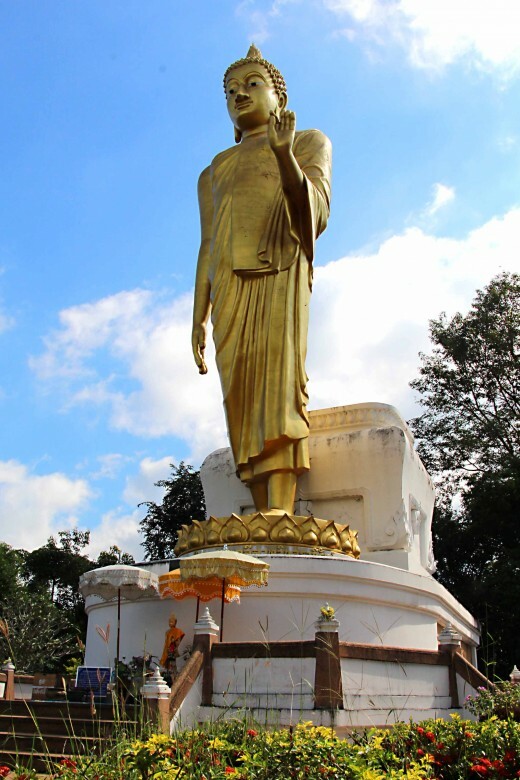 Phra Yai (Big Buddha) stands 19-metre-high, a golden statue constructed in 2001, and visible for miles around. In Loei Province, it's not just the teak buildings of the Walking Street which conjure up visions of the past - it's also the traditional arts and crafts of this region still practised in some rural locations. 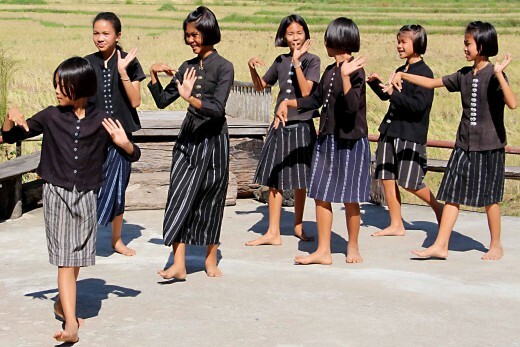 The province has a unique blend of eastern and northern Thai culture - as well as strong Laotian influences, and these are maintained by local ethnic groups such as the Tai Phuam, who arrived from Laos in the late 19th century, and the Tai Dam, who originally came from Vietnam but migrated here through Laos at about the same time and throughout the 20th century. Both of these groups have kept much of their cultural heritage including their own regional dialects, religion (combining ancient spiritual beliefs with Buddhism) and traditional forms of dress. 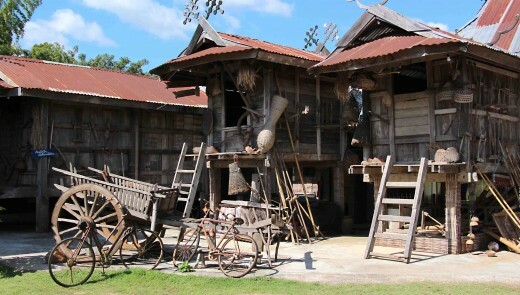 One location of interest just a few kilometres south of Chiang Khan is the Tai Dam Cultural Museum. Here antiques and curiosities associated with the history and the lifestyle of these people are exhibited, and there are souvenirs for sale. 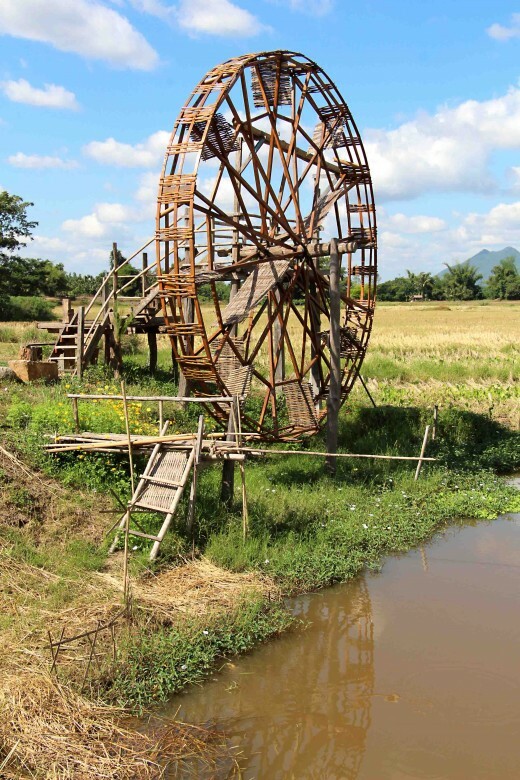 There are larger scale displays too, such as the old waterwheel shown in a picture here, and there may be demonstrations of craft techniques. If you are lucky - as I was - you may well be entertained by a local dance troupe such as the one which is illustrated here, and in the first photo of this article. 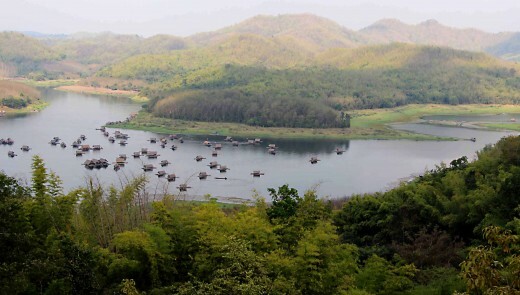 Local homestays are also available nearby for those who wish for an even more authentic experience of life in the Tai Dam culture. A little further down the road from the Tai Dam Museum is an authentic, living, breathing example of just one element of Tai Dam culture. 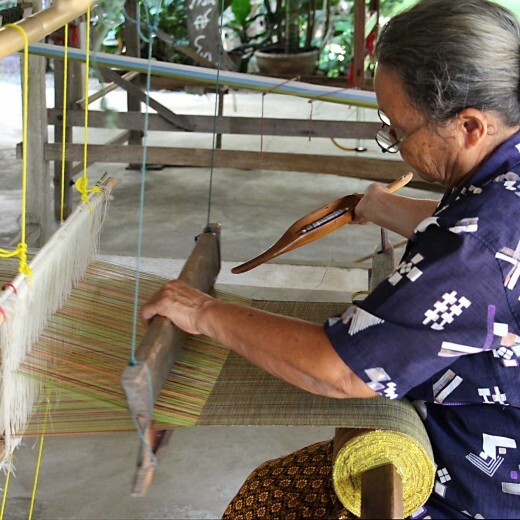 At a village called Ban Napanad, quality textiles of silk and cotton are being handmade by local women. Clothes such as blouses, scarves or skirts, kitchenware such as placemats, and personal accessories such as purses and handbags, are the types of items created here. 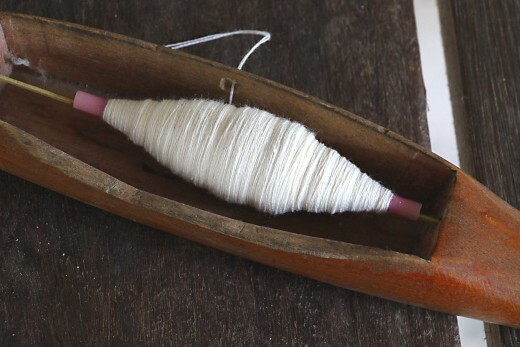 Here one can watch the production process all the way through as women weave cotton from thread to finished product on the same looms as have been used for many centuries. And of course there is also a shop on the premises where tourists can buy the kinds of produce they've just watched being created. 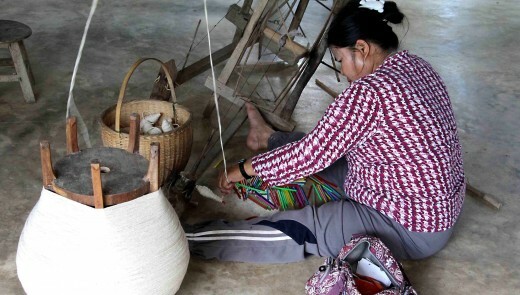 The Tai Dam people traditionally wear black, but for today's market natural dyes are used to colour the fabrics at Ban Napanad (some other groups elsewhere use less expensive, but also less environmentally friendly, chemical dyes). The Ban Napanad Weaving Group was founded by Mrs Sopha KhumKham in the year 2000, initially just to make clothes for the local villagers, but since then the Group has developed into a more efficient, higher quality operation, trading not just locally, or in the cities, but internationally too. These days it's hard when buying souvenirs such as this in the town of Chiang Khan to distinguish between the genuine article, and mass produced fabrics which may not even be local in origin. 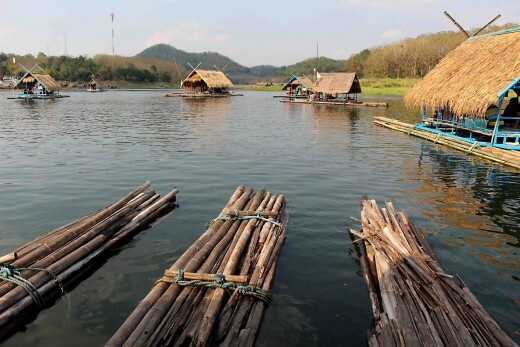 But Ban Napanad is one place where you can be certain about the authenticity of the Tai Dam weaves on display. Almost no discussion of Thai cultural life - city or rural - is complete without mentioning the Buddhist temples. 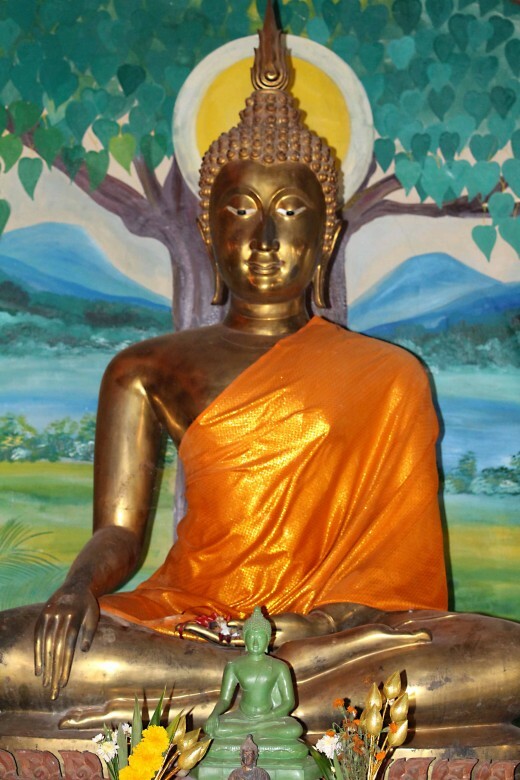 Buddhism pervades all aspects of culture, and even though most Thais today are quite relaxed about their beliefs and tolerant of all other belief systems, nonetheless temples and Buddha statues are to be found everywhere. Temples in the town of Chiang Khan will be mentioned later, but in the countryside they stand in the most prominant of vantage points, particularly on the tops of hills. Often a Buddhist statue such as the one depicted earlier, can be seen from far away, perhaps giving spiritual comfort to its followers. One temple will be described here. About 10 km east of Phu Thok is the temple of Wat Phra Phutthabat Phu Kwai Ngoen - The Temple of the Buddha’s Footprint. 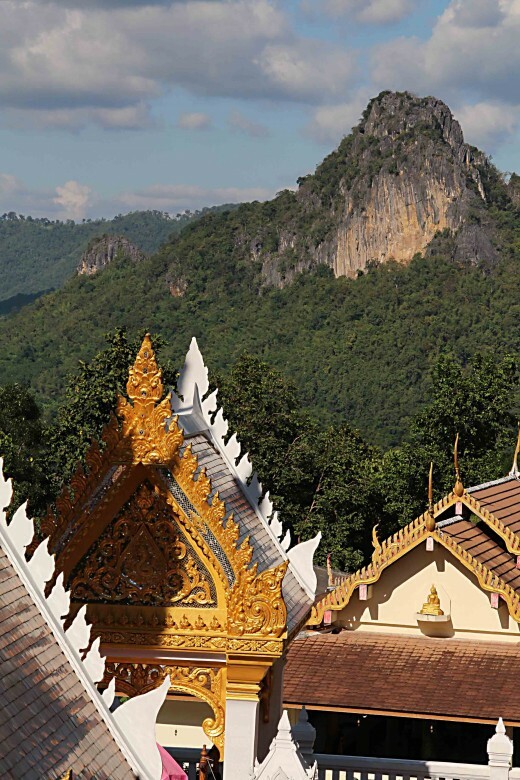 Set in beautiful mountain country (this is the temple shown in an earlier photo of a forested mountain slope) the key feature is the giant 'footprint' - 120 centimetres long and 65 centimetres wide, set in a large slab of stone. 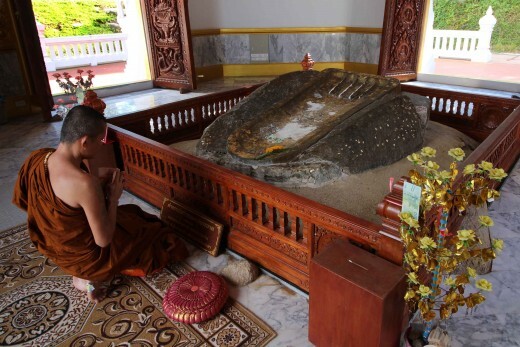 Buddha footprints have a symbolism in Thai culture, representing a spiritual path to be followed. This particular footprint has some additional folklore associated with it - the local myth of a beautiful man-eating ogress who once used to tempt human males to an unedifying end - and a light snack. One day the Lord Buddha passed by and remonstrated with her, and so powerful were his words that she vowed never to eat men again!! Whilst talking about the countryside around Chiang Khan, I must mentiion Huai Krathing Reservoir. 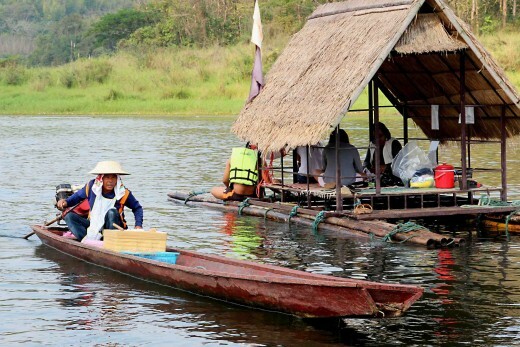 It is a little far from the town for a visit during a weekend stay unless you have access to a car, as it's located on the Man River about 50 kilometres south of Chiang Khan. However it's on the route which many will take to get to the town, and if passing by, it is well worth a stopover for one of the most novel lunching experiences one could wish for. A fleet of thatch-roofed, bamboo rafts awaits on the shoreline. You rent one of these, and you're then towed out by motorised longtail boat into the middle of the lake, where the raft is anchored. Lunch is ordered from a menu and later brought out to you. The raft is then yours for as long as you want for lunch, to rest, or to swim. And when you're ready to be towed back to shore, you just raise a flag on a flagpole as a signal to the operators to come and get you! The sites and experiences we have so far described are all outside of Chiang Khan Town, but even if one only has a few hours to spare and no time to travel, there is still plenty to see and do around the town itself, besides the main attraction of the Walking Street. 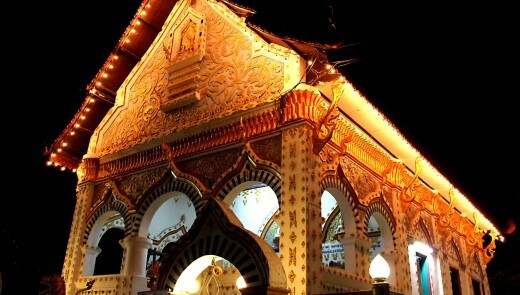 And especially so, if one is fortunate enough to arrive during the time of the Phi Khon Nam Festival. 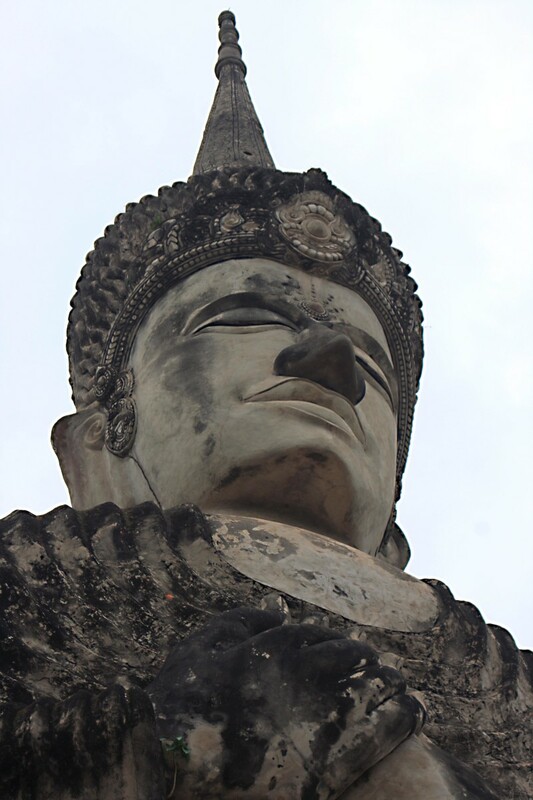 The visitor to Chiang Khan at any other time will surely see several grotesque masked statues dotted around the town. They may seem somewhat incongruous, but they are there in acknowledgement of an ancient belief in the spirit world, and each year, usually in May or June after the end of the dry season and just before the commencement of the main period of intensive farming, a parade is held in which the locals don brightly painted wooden masks which face upwards to the spirit world as a plea for plentiful rain. Many of the masks have antlers representing the buffalo - a tribute to the work animal which played such a valuable role in farming here before the advent of modern machinery. 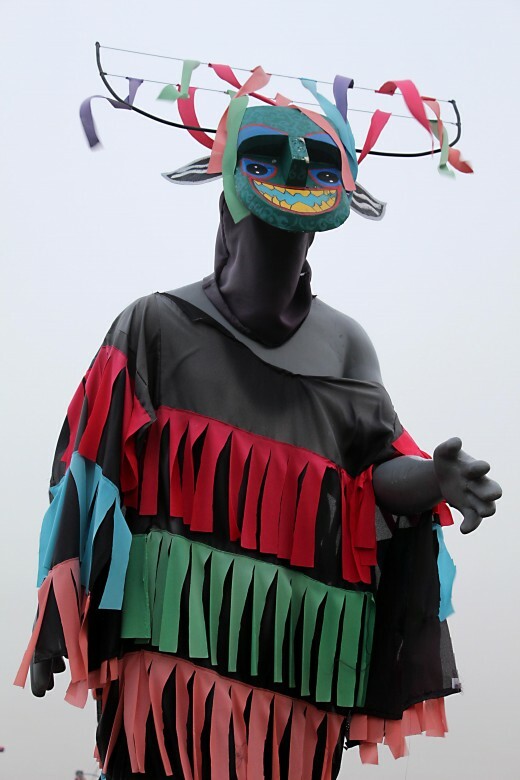 In addition to the masks, there is dancing in homage to ancestral spirits and music with drums made of everything from buckets to cowbells, and of course, plenty of food and drink. The festival is analogous in some respects to Carnival in the Western hemiisphere - a heady mix of tradition, colourful pageantry, religious undertones, but above all, lighthearted fun. And it all goes on for three full days. In the town of Chiang Khan, 90% of the attention is focused on the Walking Street, but for any who venture further afield there are the usual sprinkling of Buddhist temples which one finds in any Thai town, and these are worth a visit for their ornate architecture, their brilliant gold leaf paintwork and their murals and Buddha statues.They date from a range of periods from the mid 17th century to the 20th century, and as such, reflect a variety of styles and influences. For the most part one is free to enter and wander around most parts of these temples (the only requirement is to remove one's shoes upon entering the main temple building). On any visit to Chiang Khan one can't ignore the great waterway and original lifeblood of the town, the Mekong. This river is the greatest transport artery of southeast Asia and since the earliest beginnings of Chiang Khan it has been vital to the town's existence, providing opportunities for fishing, for its water supply, and for communications and trade with the rest of Thailand and neighbouring countries. At this point the Latian border lies in the middle of the river. One shouldn't spend more than a day in Chiang Khan without taking to the Mekong. 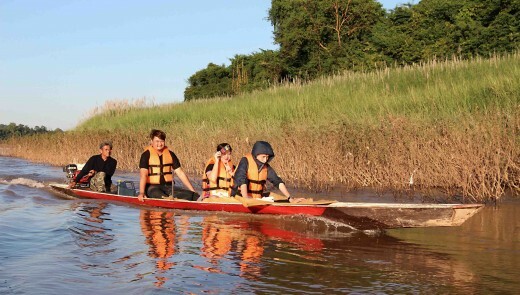 It's a great, relaxing way to enjoy a different view of the town and countryside, and for this reason there are a variety of boats catering for tourists which can be booked at tour operators or in guesthouses on the Walking Street just a few metres south of the river bank. 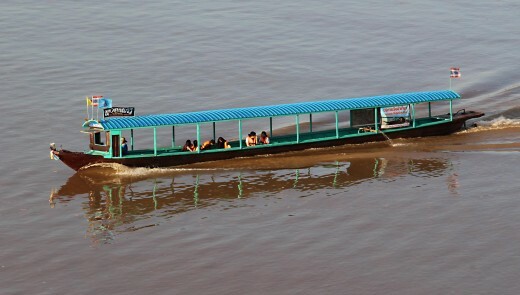 Excursions on the Mekong offer varying degrees of comfort, including full day trips to visit other towns, as well as places to swim. There's also a series of cataracts further down the river which can be visited, and which are described on one website as 'dramatic, without being dangerous'. For most, a shorter trip by motorised longtailed boat lasting a few hours may be all one has time for. 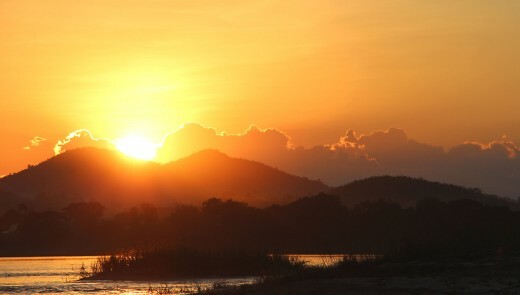 And if you start your trip late afternoon, then the experience of watching the sun go down over the Mekong is a very exotic memory to take away from Chiang Khan. 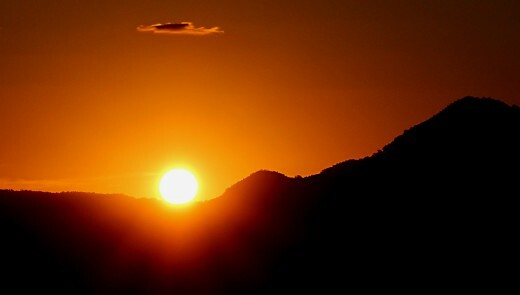 That was the trip which I took, and one sunset photo from that trip will be found at the conclusion of this article. The guesthouse chosen by the author was perfectly adequate and perhaps typical of the accomodation along this road - a small but comfortable en suite room. There was no bar or restaurant as such, but the management provided free meal tickets for breakfast in a cafe across the road. If one wishes to leave Chiang Khan to explore the local countryside, and one doesn't have their own car, then hire cars or motorcycles can be picked up in town. The down market option is the ubiquitous bicycle. Bicycles can be hired on the Walking Street for a full day for a pittance, and they are very much the best way to get around the town itself. Indeed they have become very much the symbol of Chiang Khan and 'I ♥ Chiang Khan' style souvenirs of the town will most often feature the motif of a bicycle. To travel further into the countryside, many Thai tourists will arrive on coach tours. Alternatively, for an efficient way to see as much as possible in a short time period, I would suggest seeking out a travel guide like 'Sirt'. Sirt offers good value, flexible excursions from his base on the Walking Street, and in his company I and my girlfriend saw the Big Buddha, Thai Dam Museum, the Ban Napanad Weaving Group, and the Temple of the Buddha's Footprint, all in the space of about four hours. So this is Chiang Khan. 600 km (350 miles) from Bangkok, the town may not be a practical excursion for the casual visitor to Thailand, but for any who venture to northern Thailand or who are backpacking through southeast Asia, Chiang Khan offers something different, as well as some sights and experiences not to be found elsewhere in the nation. 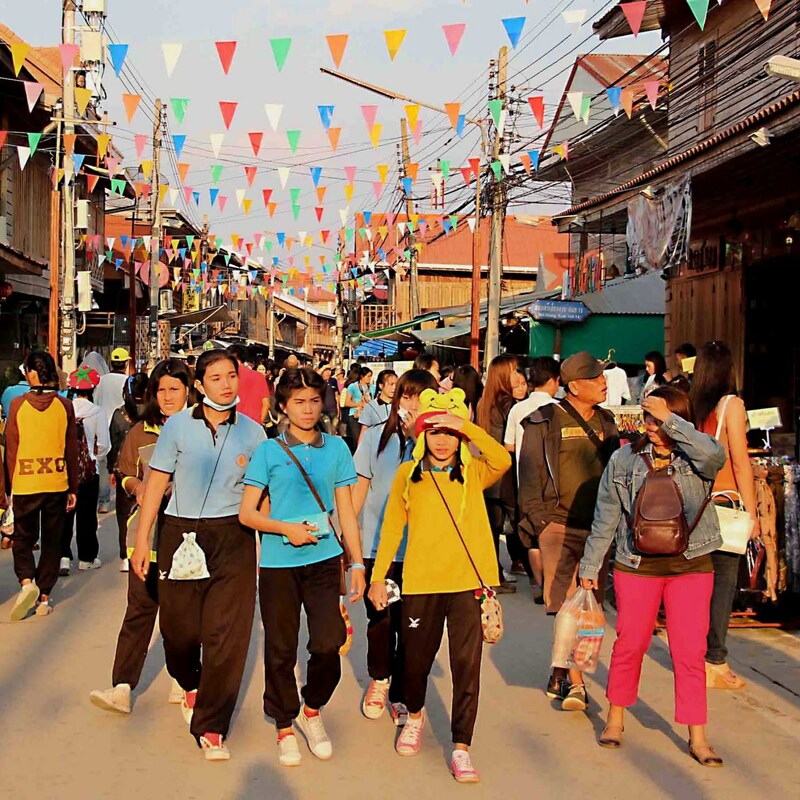 For Thais, Chiang Khan and its Walking Street are one of their favourite holiday destinations within their own country. No one will go to Chiang Khan and not visit the Walking Street, but the out-of-the-way location means that to make the visit worthwhile, most will spend more than a day here and will therefore want to explore further afield. I hope that this artcle of personal experiences and photos from the entire region, together with my other article about Chiang Khan, will have helped give some pointers as to how best to make memorable use of one's time in this part of the world. My thanks to Fern Butsawa and Cheewa Ruangsawang, and to Wanna Sonkunha for accompanying me on my visits to Chiang Khan. This is really interesting. I had a Thai friend who came from this area but I have not travelled to this place though I had been in Thailand so many times. This is new learning for me. This is a very interesting article with beautiful photos, Alun. 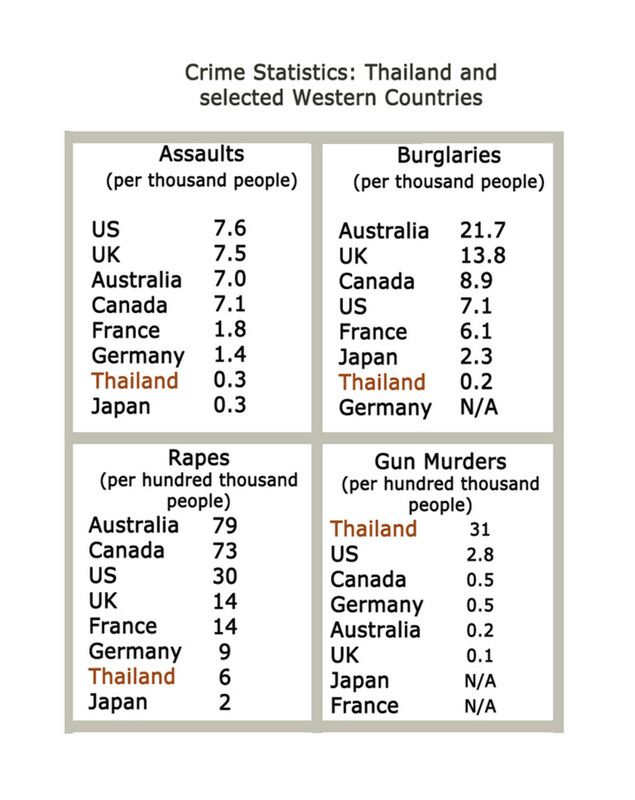 I'm almost certain that I will never be able to visit Thailand, so I love to read great articles like this. 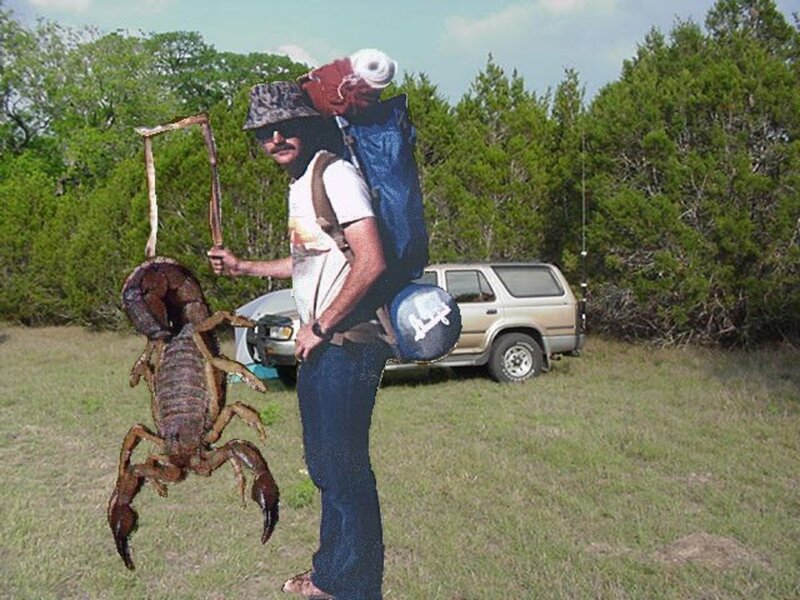 Your trip must have been a wonderful experience. The photos were marvelous and your knowledge of the history and culture as well as traditions was so in depth. You were the experienced travel guide for a trip that many of us will never take. So well done! Thanks for sharing the history, the culture and lifestyle of Chiang Khan and its many activities on the Walking Street. Articles like this make us richer in knowledge about other people we would never meet otherwise. Good photography too. What a trip! my neighbour goes there every couple of years, but I never realised how interesting it is! great hub! Louise Powles; Thanks Louise for that. Certainly there is some great scenery to enjoy in Thailand. Hope you get there one day! Thailand looks a beautiful country. I'd love to go there sometime.